The year is 1835 - in the back alleys of London John Campbell-John is running for his life. A rogue, imposter, swindler - a man without honour, without empathy for his fellow man. But his massive debts have now vindictively caught up with him. He has even stolen from his best friend. He has one option - to flee the country In Venice there is a chance encounter and an unlikely friendship emerges. Robert Babcock is everything John is not - honourable, academic, a man on an admirable quest - to travel in Egypt to find the earliest original copies of the Gospels to prove the reliability of the story of Jesus, as told in the King James Bible. 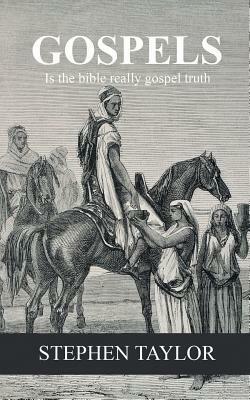 Is Gospel Truth, as we say today, really undeniable. A story of discovery, of adventure from the River Nile to the endless deserts of Sinai, and ultimately a personal redemption. ST: Let me introduce myself, I am a writer. There I’ve said it. It took me a long time to be able to call myself that - a writer. I just used to tell people that, “I do a bit of writing.” I feel like a new recruit to Alcoholics Anonymous, standing up and admitting to the world that I have a problem. I needed to stand up and admit - yes, I’m a writer. Welcome to my world. My addiction has been with me for over twenty years now; it’s the craving in my particular life. I need to write, I need to tell stories. When I was younger if somebody told me a good joke, when I retold it, it was twice as long, embellished, the story enhanced, the characters fleshed out. I’ve always done it, it's something in me, I suppose. With me, it was never just about and Englishmen, an Irishman and a Scotsman. It was an Englishman in a bowler hat with a monocle, an Irishman in a donkey jacket with a pint of Guinness and a Scotsman in a kilt with a set of bagpipes. ST: I've been writing novels for over twenty years now. I started with contemporary fiction but then moved to my favourite genre - historical fiction. I had previously conceived of a Georgian trilogy, three stories set in London; a decadent time a decadent place, but a gold mine for an author, with some deliciously naughty and profligate characters. The first novel, No Quarter Asked, No Quarter Given was long-listed for the Brit Writers Award. The second Novel, A Canopy of Stars, the third, Ripples and Shadows, was the winner of the Great Beeston Book Read. Then somebody asked me what happened to one of my characters, John Campbell-John - I should tell his story; what happened to him. ST: Oh, the new novel, Gospels - it's primarily historical fiction, but it is also an adventure story. A story of discovery, of adventure from the River Nile to the endless deserts of Sinai, and ultimately a personal redemption. There is also a back story of bible hunting in Egypt, but it's not really a religious story, even though our characters are forced to face some uneasy religious truths. ST: I am a history buff at heart. I love the idea of winding fictional characters through historical events and times. ST: The skeleton of the story was set down from the start - that's the way I work, and was as follows. The year is 1835 - in the back alleys of London John Campbell-John is running for his life. A rogue, impostor, swindler - a man without honour, without empathy for his fellow man. But his massive debts have now vindictively caught up with him. He has even stolen from his best friend. He has one option - to flee the country. In Venice, there is a chance encounter and an unlikely friendship emerges. Robert Babcock is everything John is not - honourable, academic, a man on an admirable quest - to travel in Egypt to find the earliest original copies of the Gospels to prove the reliability of the story of Jesus, as told in the King James Bible. Is Gospel Truth, as we say today, really undeniable. Then I read about the real-life bible hunters in the nineteenth century. Robert Curzon, in particular, left behind a published account of his travels in his book Visits to Monasteries in the Levant. This opened many more story-lines for me. It was a goldmine, as not only did it recount his travels, but it has detailed descriptions of the people he met, how they dressed, what they ate, their manners, etc. But what’s more, it gave me an insight into the Egypt that he encountered in the 1830s: an eyewitness of the time period I have set the story in. ST: The Flashman novels by George MacDonald Fraser. I didn't realise it at the time of writing however. ST: Bible hunting is historically accurate. These men were academic adventurers in the nineteenth century, and I had to get their history correct as well as the chronological history of the gospel writers. ST: Writing about the Cairo souk (the bazaar). Finding enough adjectives to do it justice. ST: I keep a normal working week - Monday to Friday and write for 3 hours every morning. ST: Love, love, love - To Kill a Mocking Bird. I read Catch 22 as a young man and it was part of my rite of passage into adulthood. Just realised that they are both American. Big Dickens fan as well. ST: A crossover novel, part medieval 1152 England where a young girl is hanged as a witch after claiming to have had a vision of the twenty-first a century and the murder of an Angel. Its recorded in a chronicle and when it is translated the historian realizes that it matches a modern crime. Mustn't say too much. L: What is your preferred method for readers to get in touch with you and your books? Please provide links. ST: Through my web site please - stephentaylorauthor.com. Or through Goodreads www.goodreads.com/author/show/6525446.Stephen_Taylor - recently joined. ST: Yes - the hardest part about writing a novel is to START. I always tell people at Book-fairs this simple advice. Don't keep putting it off.